The horse is controlled by a lunger who sends him in a circle around them on the end of a lunge line which is attached to the bridle the horse wears on his head. The horse also wears a special surcingle around his belly which has hand grips and stirrup-like loops for the vaulter’s feet. 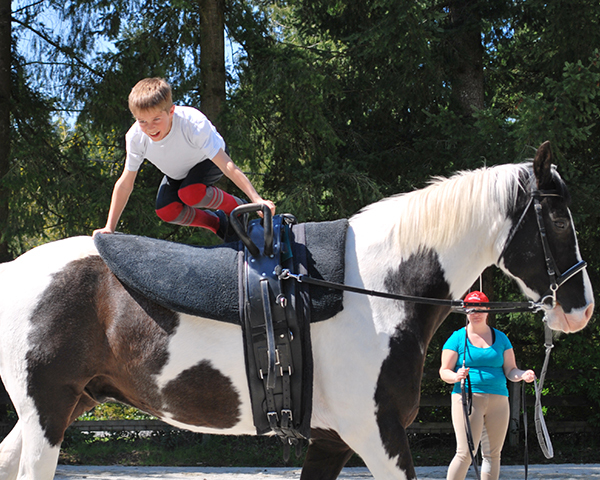 Vaulters begin working in walk and progress, with training from a qualified instructor, to be able to execute fantastic freestyle performances in the canter. Vaulters learn to have the agility and athleticism of gymnasts, the grace and expression of dancers and the balance and feel of equestrians.